Sometimes you have tried all you can think to try and you still are getting no where with your child. You need to correct your child and teach her to obey, but you are making no progress. This post outlines what to do when this happens. Your best friend swears by time outs. A time out will solve your discipline issues, she assures you. You eagerly give it a try; it doesn’t work. The attitude continues when the time out is over. Sound familiar? You will find many, many times that you come up with some method for discipline–a reward system, time out policy, loss of privilege policy, staying calm, etc.—hoping to have it be the magic ticket and you just don’t get the results you are looking for. Or maybe it worked great the first few times but then you soon find your child stops responding to it. So what do you do? Do you keep at it, hoping it will start to work at some point? Do you change it up because you might not have the right method for your child? Do you keep your head down, press on, and hope time and maturity will bring this to pass? 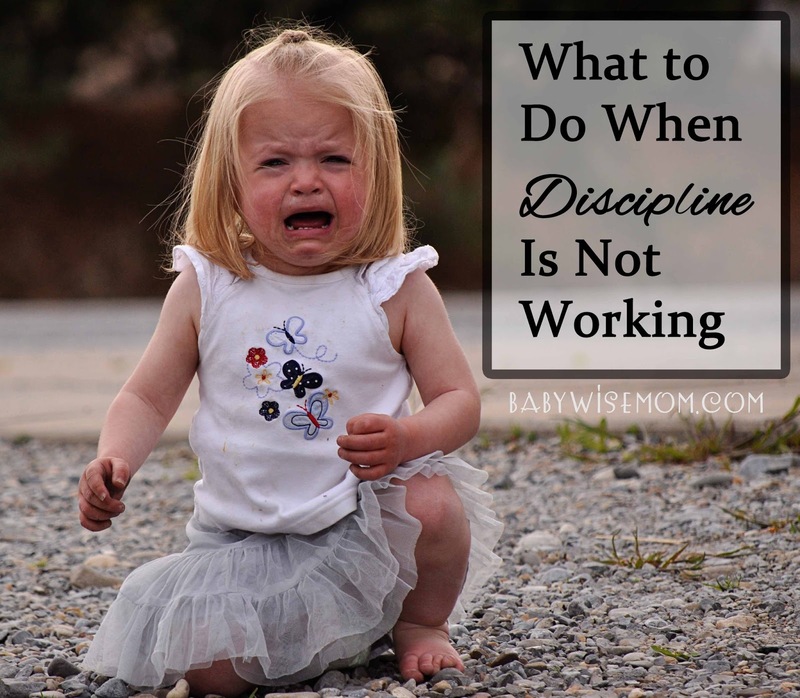 I have talked before on the fact that Discipline is Not Instant Gratification. Here are some ideas for what you should do when it seems like things aren’t working. You need to first take an honest assessment of how things are going. Be true with yourself. You won’t be able to fix something you don’t acknowledge is broken. If you are Constantly Needing to Correct the Child, something is off. If there is one area you are struggling, it might be that you need more time. Are you being consistent? Are you consistent in expectations? Are you consistent in reactions? Are you consistent in follow through? Are you consistent in applying and sticking to consequences? Be sure your expectations are within line of what is possible for a child to give. Children are children, and human children. Think of how much you mess up in a day. Children will not be any more perfect than you are. A lot of times, children don’t respond to discipline because they think they know better. Kids are often times more patient than we are. They know they can wear us down with enough perseverance. See the following posts to find out if you have wise in own eyes issues and what to do about it. Is your child getting enough sleep? An overly tired child will not behave as well as a child who is well rested. I see this with my children. This is very obvious in the young children. A child late for naps will often have major break downs. Hungry children are also less likely to obey. Have extra patience when your child is hungry. Also, be sure your child is getting varied foods at meals. Serve healthy foods and foods with protein to last in the tummy. Be aware of any foods that lead to your child acting out. Is your child allergic to something? Does your child get crazy after eating something with food coloring? Be aware of how food impacts your child’s behavior. Free play is important, but a child who is left to his own devises for most of the day is likely to find trouble to get into. Find the right balance of free play vs. structured play in your day. Do you follow through? Every time? Or do you at times laugh at how cute the child is–that little rebellious streak can be so funny. I know I often feel really tempted to reward my little Brinley’s creative sass with giving in. If you live in a culture where people value initiative and independence, you can be tempted to find that streak cute. When I feel tempted to let things slide, I remind myself of Credit Card Parenting and follow through. Do you ever give threats you can’t or won’t make good on? I have heard real parents really say things like, “If you scratch him again I will bite your fingers off!” Now, you obviously aren’t going to bite your child’s fingers off, so just don’t say stuff like that. Do you ever just frankly choose to be lazy rather than carry out what needs to happen? If so, you are making more work for yourself in the long run. You really want to figure out what works for your child. As you seek out knowing what works for your child, really look at logical consequences that can be tied to different scenarios. Understanding how to respond logically can really help you in finding the right way to respond. Let me give a note. Some children are extremely happy and optimistic. I have one of these. It is such a fantastic quality in life…until you are trying to find something that works for the child. The optimistic child will find the best of the situation and not be bothered by consequences. Let me just encourage you to continue on your path. Those optimistic children do start to get more obedient as you are consistent, even if they don’t act like the world is ending when you give a consequence. This is especially true for those big, deeper issues. Lying will not be solved in a day, week, or month. Many times, it takes longer than a year. Lying is a developmental milestone in a child’s life and it will take more than a couple of time outs or extra chores to get your child to stop the lies (see Why Kids Lie (and what to do about it) for more on that). Moral issues take time to really take seed. You can’t correct it quickly. There are no shortcuts here. You have to expect it to take a fair amount of time with the big issues. The small issues often take time as well. How many times as adults do we make the same mistakes over and over again even when we really want to stop that mistake? How many times do we say something we don’t mean? How many times do we lose our patience with our children even though we hate that we do it? Children are humans, too. Children should be expected to have even less self-control than an adult has. I think a big question we have is do I give it more time or do I change the way I am approaching this? If your child is showing no remorse and no effort to improve on the behavior/stop the behavior, try a difference consequence (and be sure to consider the teaching aspect discussed below). If you are seeing effort, a repentant heart, and improvement, stay on your course. Remember if learning didn’t happen, the discipline didn’t work. You can’t have punishments for the sake of punishments. You need to explain what was done incorrectly and discuss what could have been done instead. Work on empathy and on understanding the perspective of others. Children want to be good most of the time. They don’t like to get in trouble (unless they are attention seeking). Teaching them helps them know what to do differently in the future. It gives them the tools for success. This goes along with teaching. Teaching the child helps prevent further offenses. It doesn’t erradicate them completely–again, children are humans and imperfect–but it helps give them tools to not do it again.